By engaging with our clients at an early stage we can work with them to bring their vision to life while assuring cost certainty and budget control. We then collaborate with all stakeholders from planning to installation. For specification and procurement we have access to maximum choice from the whole market through our huge network of suppliers, and provide informed, unbiased advice. We provide all aspects of loose and fixed FFE, deploying the specialist knowledge and experience of our project managers and supply chain, and work directly with the client, local authority, contractor, architect or PM company. The successful frameworks we have in place include with Southern University Purchasing Consortium (SUPC) and Hampshire and Somerset County Councils. 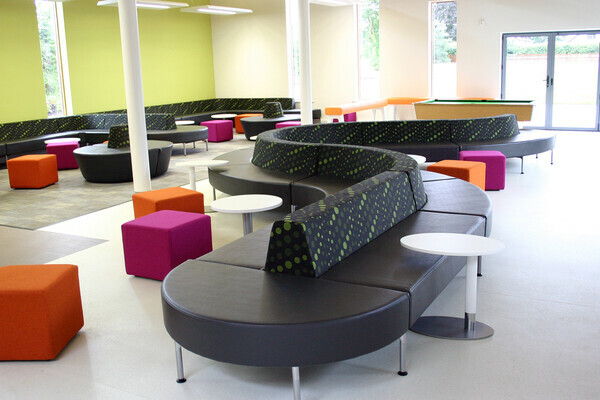 Portsdown transformed Brighton and Hove Sixth Form College, providing the full design, supply and installation of new furniture for a new building including 12 classrooms, plus refectory, multi-functional and breakout spaces. The tender was won on the quality of our conceptual designs and flexible furniture specifications, and the project was completed with aplomb on a Friday 13th!